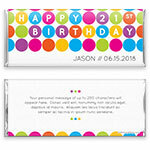 Vibrant polka dots make this bright, cheery candy bar wrapper a wonderful choice for your party! 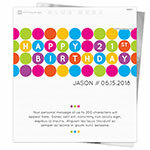 Design: Bright coloured polka dots on a white background. Personalization: Front number, name and date with back message.